For the Love of Theatre: How two experts’ love of the arts helps foster theater in the Lakes Region. Join Taylor Community for a casual evening of conversation as Renee Speltz, chairman of the board of the Winnipesaukee Playhouse, and Marketing Manager Lesley Pankhurst, share how the Playhouse came to be. The lecture is Wednesday, Feb. 8 at 6:30 p.m. in Taylor Community’s Woodside Building. It is free and open to the public. The Winnipesaukee Playhouse is a 200-plus-seat courtyard style theater located in Meredith. It produces both a professional summer stock season as well as a community theater season. Over the past eight years, the theater has received 46 New Hampshire theater awards, more than any other theater in the state during this time. 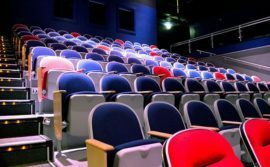 In 2009, New Hampshire Magazine named it the Best Professional Theater in the state. In 2013, the Playhouse moved from Weirs Beach in Laconia to the former Annalee Dolls campus in Meredith, allowing for offices, dressing rooms and a lobby.